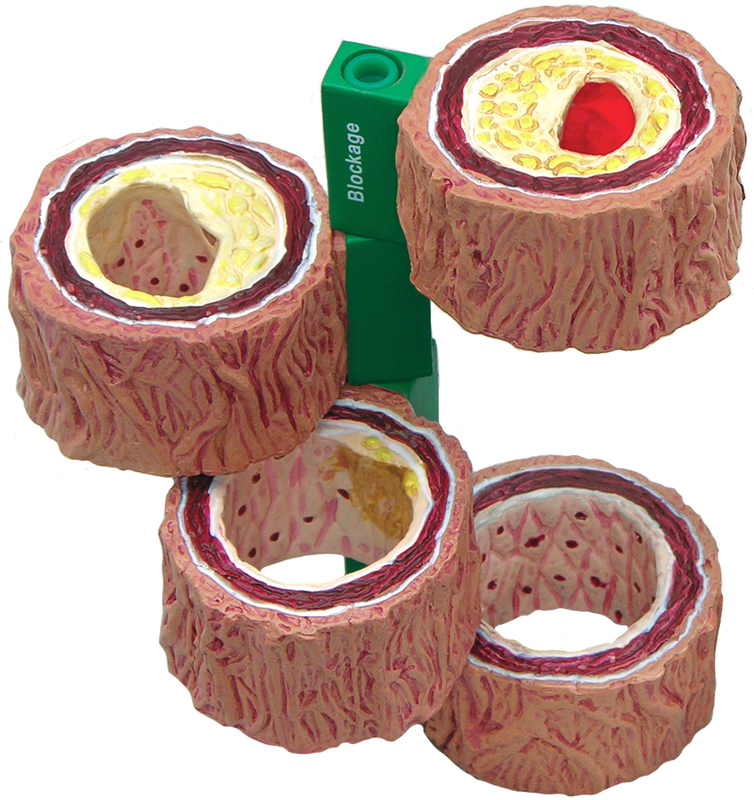 This one-piece, oversized artery "Y" section with cutaway portions shows build-up of cholesterol deposits in several locations. Removable patient education card and base included. 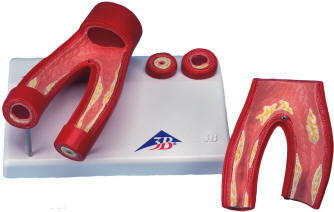 With the help of this anatomical model doctors can explain changes in the blood vessels due to arteriosclerosis. A horizontally dissected artery fork is depicted with arteriosclerotic change in four different stages from slightly sedimented to a completely clogged vessel. Comes with stand. 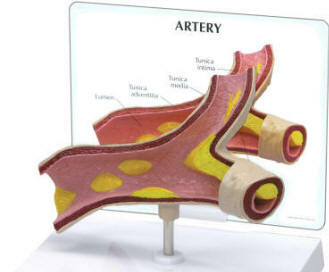 This models shows four sections of an artery demonstrating atherosclerosis in which the narrowing of the artery is due to a build up of fatty tissue (cholesterol) and plaque. 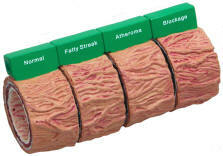 4-stages: normal artery, fatty streak, fibrous plaque, and blockage. 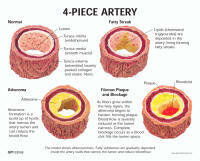 The stages cause a decrease in blood flow, which can lead to a blood clot or thrombus. All stages rotate on hinge pin to form a compact package. Comes with patient education card. The artery and vein model shows a medium-sized muscular artery with two adjacent veins from the antebrachial area with adjoining fat tissue and muscle enlarged 14 times. The micro anatomy™ circulatory system model illustrates the reciprocal anatomical relationship of artery and vein and the basic functional techniques of the venous valves (“valve function” and “muscle pump”). The left vein and the middle artery are fenestrated in the upper anterior segment, revealing the various layers of the wall structure in a cross and longitudinal section and in top view. The right vein is opened throughout in the anterior segment, revealing the orifice of a feeder vein and two venous valves, i.e. “flap valves” formed by a duplication of the tunica intima. 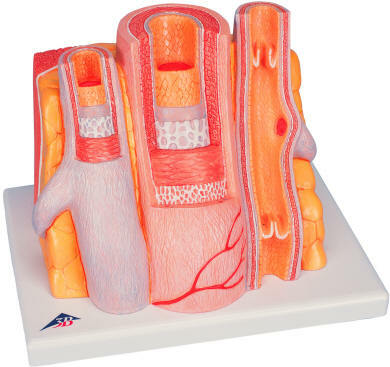 On the rear of the artery and vein model, the relief of two veins is shown to illustrate the functional aspect of the venous valves. A great tool for teaching about the human circulatory system. Artery and vein supplied on base.